This creamy Greek lentil soup is packed full of veggies and herbs with a touch of lemon. Don’t forget to sprinkle with feta! Let’s call fall 2016 the season of the soup. I’ve been feeling the soup. You’ve been feeling the soup. We’ve had Thai Slow Cooker Chicken & Wild Rice Soup and Broccoli, Ginger & Turmeric Soup, and even Healthy Quinoa Cauliflower Chowder. It must just be a cozy kind of year? Or maybe, since 2016 is supposedly the worst year ever, we’re just eating our feelings. I dunno. World events aside, 2016 has been a bit of a personal roller coaster for me. 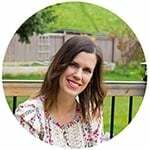 I was exhausted, depressed and confused after graduating last year and I feel like I’m starting to find myself again. I won’t bore you with the details but I’m feeling pretty glad to have 2016 behind me, and looking forward to great things in 2017. How about you? Are you glad to get this year behind you? Are you ready for a fresh start in 2017? Wow, you guys! This post was first drafted on September 30. Oops! I totally meant to share it sooner with you, but I kept shifting my schedule around and here we are…December 14…and I’m finally sharing it with you.
. I made it when Kai and I visited my parents way back in August, and was in love with the unusual combination of flavors: lentils, lemon, herbs and feta cheese. I immediately put these flavors on my fall ‘to do’ list. 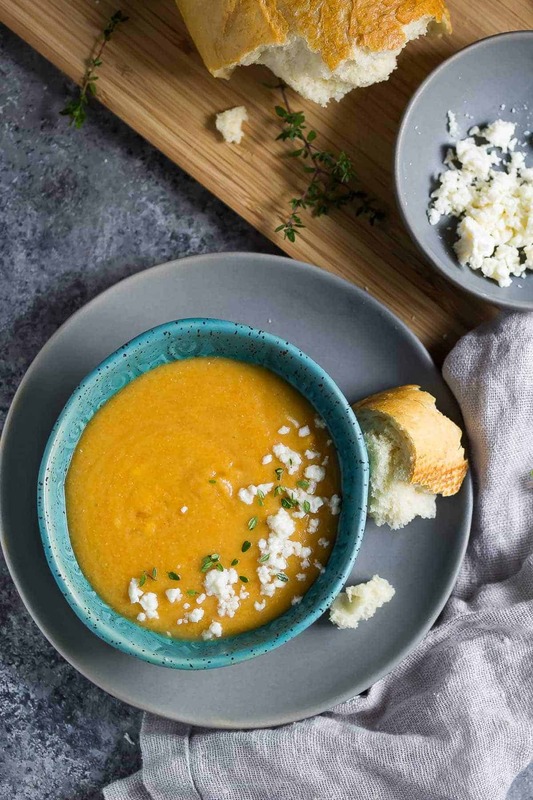 This Greek lentil soup is pretty thick (as you can tell from the photos), but feel free to add additional stock to thin it out. Do not, I repeat: DO NOT, skip the feta cheese. 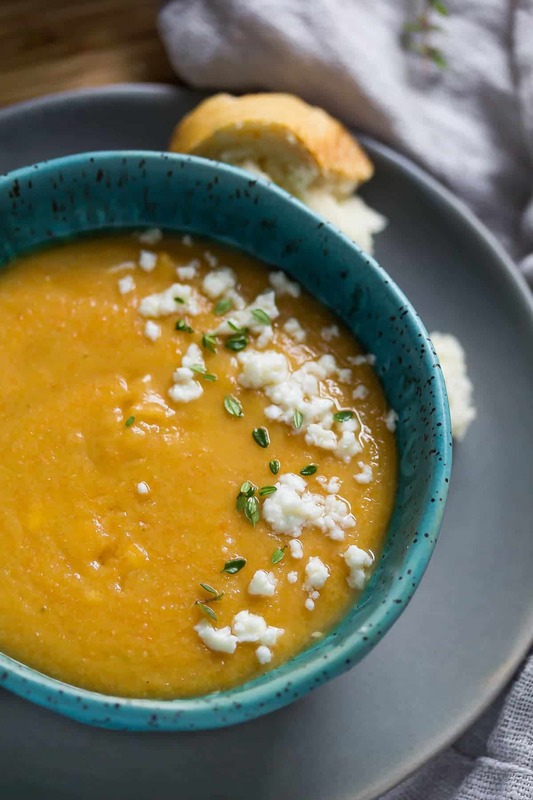 It adds the magic to this soup…the feta offsets the lemon and the herbs and adds a whole new wonderful dimension of flavors. So. Soup. You souped out? This is officially the last bowl of comforting soup I’ll be sharing with you in 2016. Here’s to hoping that 2017 doesn’t require so many bowls of soup, or hugs. 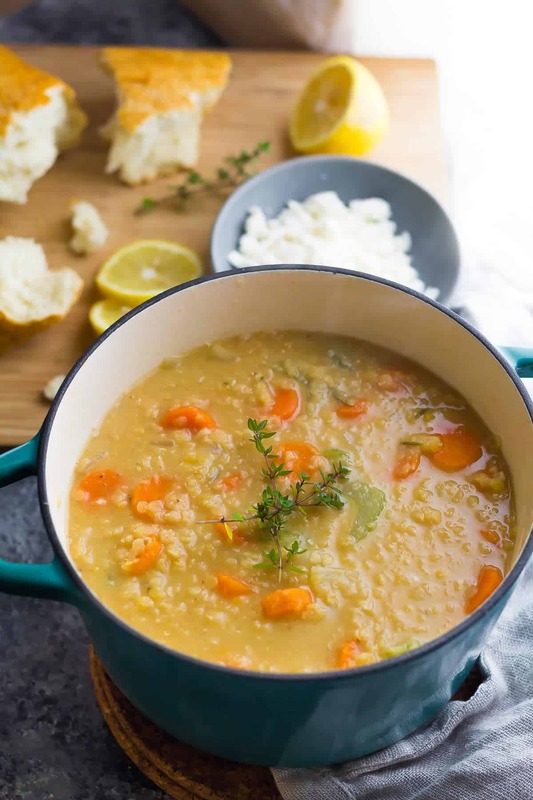 This creamy Greek lentil soup is packed full of veggies and herbs with a touch of lemon. Don't forget to sprinkle with feta! Heat oil in a medium pot over medium heat. Add the onion and stir, cooking until translucent, around 5 minutes. Add the carrots, celery, stock, sherry, lentils, thyme, rosemary, bay leaves and salt. Bring to a simmer, reduce heat, and cook for 20 or so minutes, until all vegetables are soft and the lentils are cooked through. Stir in the lemon juice, remove the herbs and bay leaves, and puree. You can alternatively serve this soup chunky. Sound great. I love the flavours of Greek food. Will certainly be trying this for work. Hi Kristen! I didn’t measure it out so I can’t say for sure, but 1 serving is 1/6 of the batch. Plans to try this soup as it looks very nutritious. I had trouble finding the recipe page but I finally did. Thanks. Hi Fran, glad you found the recipe. Hope you enjoy the soup! I made this soup this afternoon and it is wonderful. Thank you very much for this recipe. I’m so glad you enjoyed the soup, Alicia! Thanks so much for your comment and Happy New Year! haha I am definitely feeling the soup! I have been alll about them as soon as the cold weather hit! This looks fantastic – I am hooked on red lentils right now! Are you using canned lentils or uncooked red lentils that cook very quickly? Hi Judith, I used dried red lentils. They cook really quickly! This looks so dreamy and comforting. I love how you took it to the next level by making it Greek! 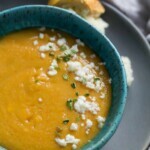 I must make this soup SOON! It sounds amazing! And who in the world would ever think of skipping out on feta?! NEVER!